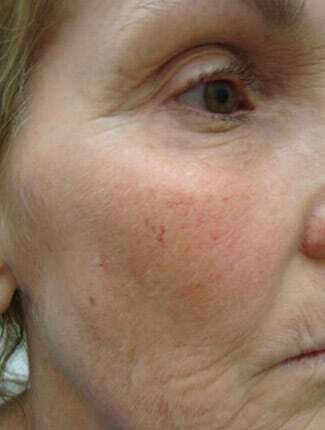 This patient presented with pigmentation, fine lines and wrinkles as well as decreasing of elasticity in her skin. 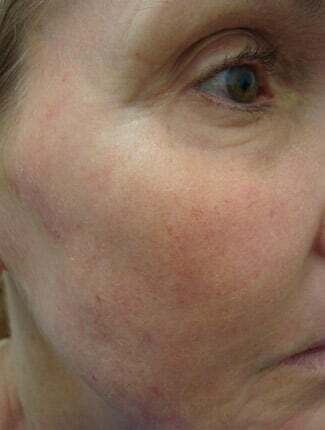 This is the patient post Erbium laser resurfacing. This highly specialised laser both significantly reduces the pigmentation and reduces the lines and creases in the skin as well as improving the skins elasticity. If you have been considering a rejuvenation treatment, facial laser resurfacing may be the perfect treatment for you. Facial laser resurfacing is less invasive than basic face lift procedures, so it can be a great alternative for patients who have minor wrinkles and creases in their facial skin. Which Problems Were Fixed with Face Laser Resurfacing? The patient in this particular case study was struggling with minor pigmentation as well as some fine lines and wrinkles as well as reduced elasticity of the skin in in her face. After consulting with Dr Lanzer it was decided the best treatment for her was Erbium laser resurfacing. With the help of this specialised laser, Dr Lanzer was able to significantly reduce pigmentation in her skin as well as reduce the visibility of any lines and creases. This treatment also helped to improve the elasticity of the skin, providing the patient with a younger appearance. What Is Erbium Laser Resurfacing? 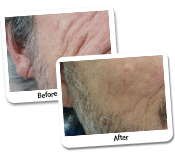 Erbium laser resurfacing is a laser resurfacing treatment executed with a Erbium laser. The Erbium laser is especially designed to remove minor lines and wrinkles on the face, hands, neck and chest area. 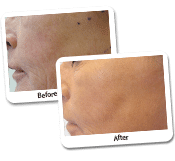 In the past, carbon dioxide laser treatments were used to treat similar skin problems. However, these treatments had various severe side-effects compared to treatments using an Erbium laser – therefore making the overall recovery time longer. The Erbium laser causes a lot less discomfort for patients during the treatment as well as minimal side effects which may include slight redness in the face for a few days. With the arrival of the Erbium laser, patients with both light and darker skin tones can now enjoy the benefits of a face laser resurfacing treatment. Patients who are considering face laser resurfacing should book an appointment at the Dr Lanzer clinic. By booking an appointment, you can speak to Dr Lanzer about the treatment and he will be able to evaluate if the treatment is right for you. Dr Lanzer in this initial appointment will explain in more detail what results you can expect to achieve, what side affects you may experience and any preparation you need to do leading up to the treatment. Patients who decide to go ahead with the treatment will be advised to stay away from certain medications and supplements for a specific period of time, especially those that can affect blood clotting. It is advised to avoid any medication such as aspirin, ibuprofen and vitamin E at least ten days before your surgery. How Will My Procedure Go? The skin resurfacing procedure is done on an out-patient basis, which means that you do not have to stay at the clinic during your recovery. However, it is advised to take a week of work so you have enough time to recover. Depending on the area the surgeon is treating, a skin resurfacing procedure can take anywhere from 30 minutes to 2 hours. If the surgeon only needs to do skin resurfacing on a specific part of the face, the surgeon will only need 30 to 45 minutes. However, if the surgeon needs to treat the entire face, it can take over an hour. Right after the procedure, the surgeon will apply bandages to the treated area. What Do I Do After Skin Resurfacing Treatment? When 24 hours has passed, you will need to clean the treated area at least four times a day to stimulate the recovery process. It is also a good idea to apply moisturiser to the affected area; this will prevent the formation of scabs. Many patients will experience some minor swelling after a skin resurfacing treatment. However, the swelling caused by a treatment with the Erbium laser is a lot less than the swelling that would occur after a treatment with a carbon dioxide laser. Patients may also experience some minor discomfort, although the surgeon can prescribe some medication to keep the discomfort to an absolute minimum. During your recovery, it can help to sleep on an extra pillow. Sleeping on an extra pillow will reduce any swelling you may experience and make it easier to fall asleep after the procedure. You can also put an ice pack on the treated area to reduce the swelling; this is usually done within the first 48 hours after the procedure. Most patients will notice that the swelling has gone down considerably after 48 hours, which means that the ice pack is no longer needed. When you choose a moisturiser to keep the treated area moisturised, do not use any products with Retin A or glycolic acids, because these substances can penetrate the skin. Glycolic acid can be a really good addition for a skin peel, but it cannot be used after a skin resurfacing procedure. Patients have to wait at least six weeks before they can use these products again. 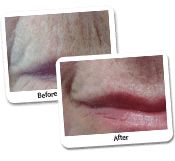 The redness caused by skin resurfacing is minor and usually dissipates in two months. These areas on your face are easy to cover with oil-free makeup or green-based makeup, depending on your preference. If you are not certain about your skincare products after your procedure, do not hesitate to contact the clinic for more information.